Center: Deer Sinew Backstrap 18". See size comparison with a soda can. Right: Deer Sinew Backstrap 24". See size comparison with a soda can. 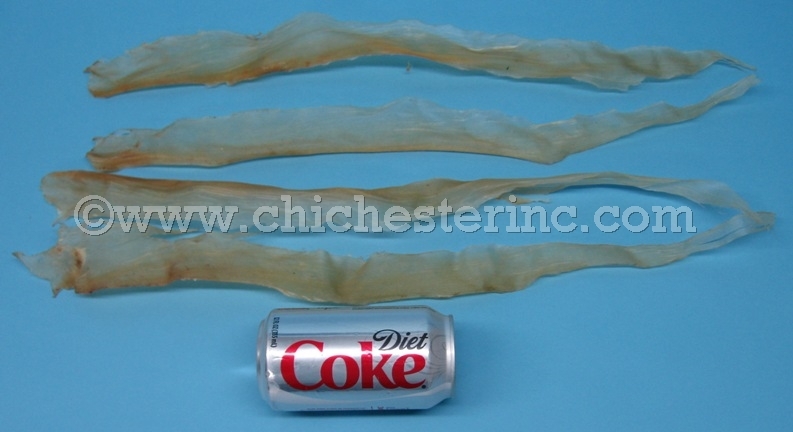 We stock real deer leg front tendons (sinew) that have been cut out and dried. They are sorted by size. They are approximately 1/8" to 3/16" thick. The 6" to 9" long sinew weigh approximately 0.2 oz. The deer backstrap sinew come from the back of the deer and are wider and flatter than sinew from the leg. They are sorted by size. They are approximately 1" to 2" wide. The backstrap sinew is wide on the end towards the neck and narrows toward the tail end. They are good for bow-backings. White Tail Deer are not an endangered species and are not subject to CITES controls. Use LPS or UNS for USFWS export clearance per Inspector Drummer 100317.